TNCS Celebrates Chinese New Year! The Chinese Lunar New Year is always a big event at The New Century School, a time to reflect on all that has happened during the prior year, connect with family and friends, and eat delicious foods, all to start the new year off in a positive way. This year is Year of The Fire Monkey, and it starts Monday, February 8th. 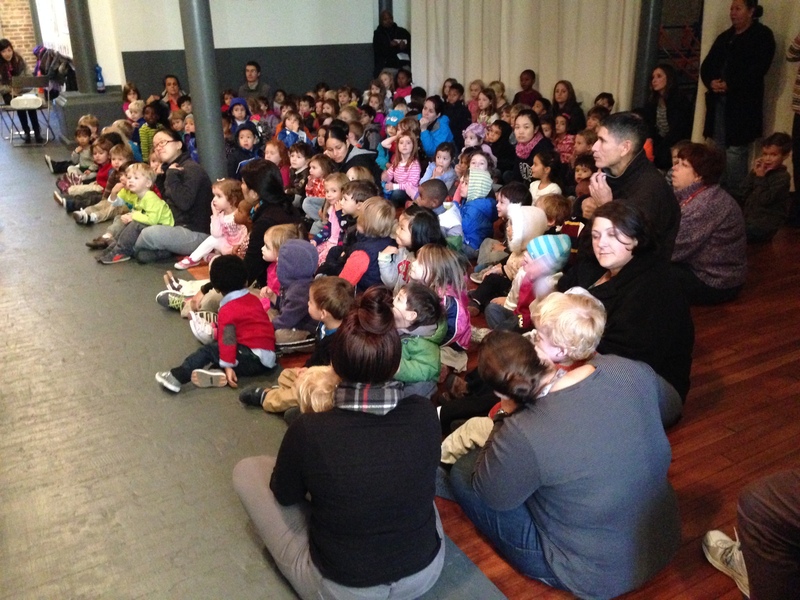 To gear up for this special occasion, TNCS elementary students attended a presentation on China On Friday morning. Given by a TNCS parent volunteer, the presentation was intended to not only celebrate Chinese culture and customs, but also to invite the elementary attendees to compare and contrast what primary and secondary education looks like in China to their own experiences here as U.S. students. Please excuse generalizations (of both schooling styles), which were made simply for the purposes of the exercise and not to pass judgment on either. Although at first glance, Chinese and U.S. schools looked pretty similar to the audience, with lots of smiling faces and a happy sort of hubbub going on around campus, the differences became more evident once inside the classroom. Discipline and respect are highly prized in the Chinese classroom, meaning that kids are not permitted to fidget and must sit quietly—on their hands, in point of fact—until called on by the teacher. TNCS students, by contrast, are given the license to sit, stand, or recline where and how they wish at many points during the day so long as they demonstrate that they can handle this freedom and attend to their scholastic pursuits. Advantages and disadvantages are evident in both approaches. TNCS students get to relax a little as well as not have to constantly fight their very natural instincts to move around, but the Chinese way allows up to 50 students per class to attend to a lesson without potential distractions from surrounding students. Another point that TNCS students were asked to consider involved what are called “specials” at TNCS and include The Arts and physical education. In China, students are asked to replicate crafts and artwork from a model as well as exercise in perfect unison, and they are held to a very high standard of performance. This can mean that they are not given much opportunity to be creative or exhibit individuality in a given school day, although the skills they master are certainly impressive. U.S. students, by contrast, are frequently encouraged to find their unique identity and then express the heck out of it. However, they may not develop technical mastery of what inspires them at as young an age as do their Chinese counterparts. So, again, one approach might work for some, another for others. The outcomes of these different approaches are, in some ways, “worlds apart.” While it’s certainly true that Chinese students command a large body of information and demonstrate their capacity for retention at test time, some of their teachers commented on their inability to think for themselves in non-academic environments. Many Western students experience nearly the exact opposite, following their individual paths of inquiry wherever they might lead and employing critical thinking and creative problem-solving to get them down the road. However, the United States ranks far below China (and 20 or so other countries) in measurable scholastic skills like math. This might matter a lot to some, less so to others, but once more the point is in exploring the two styles. Ultimately, it’s probably true that neither educational approach is perfectly ideal across all settings or contexts. Nevertheless, TNCS students enjoyed teasing out both the differences and the parallels, and it was gratifying to see them imagining themselves in the shoes of a Chinese student. Their observations were insightful and even sometimes incisive. It’s a good bet that many of them would like to visit China for themselves in the near future. In the meantime, they can content themselves with the video below of the slides presented today in addition to turning their thoughts to the approaching lunar new year, which Li Laoshi and Yangyang Laoshi are sure to help them celebrate with a bang! We hope that this Monkey Year brings you and yours health and happiness! 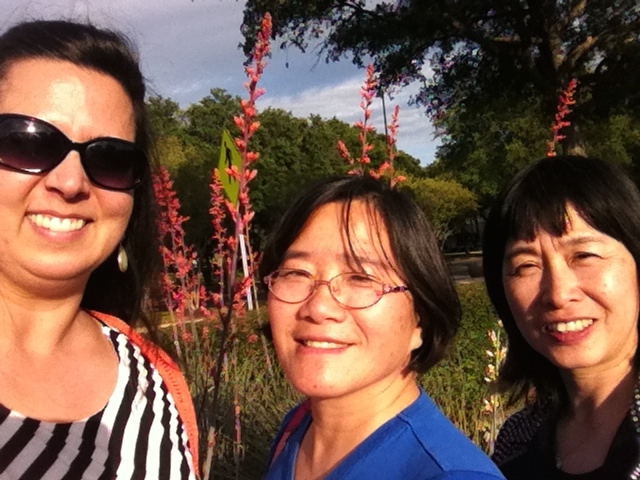 Our TNCS representatives at the Startalk conference—Admissions Director Robin Munro, Xie Laoshi, and Lin Laoshi–take a selfie! “I am a total fan of this program!” said The New Century School Admissions Director Robin Munro excitedly, upon returning from attendance at the Spring Startalk Conference Sessions in Austin, TX earlier this month. Xie Laoshi, who will act as Program Director and Lin Laoshi, who will be Lead Teacher, accompanied Ms. Munro (who will be providing administrative support) to Austin May 1–3 to learn all about implementing the Startalk program at TNCS as well as gathering resources on curriculum design, instructional materials, and assessment tools. That’s right, TNCS will be hosting a Startalk Summer Camp in Mandarin Chinese this July 21–August 8, 2014! Novice 1st–2nd grade (Note: this division is currently waiting list only): Student has little to no exposure to Mandarin Chinese. May be able to recognize a few characters, say a couple of simple phrases, count 1–10, and/or recognize when someone is speaking Chinese. Intermediate 2nd–3rd grade: Student can recognize 25–100 characters and is comfortable carrying on a basic conversation in Mandarin Chinese. Prefer that student is also able to read Chinese in Pinyin form. Novice 3rd–4th grade: Student has little to no exposure to Mandarin Chinese. May be able to recognize a few characters, say a couple of simple phrases, count 1–10, and/or recognize when someone is speaking Chinese. The program includes field trips; cooking classes; dance performances and lessons; Chinese drumming; and, of course, language learning. All meals and snacks are included. It’s a BIG DEAL. But it wasn’t just random luck that landed TNCS the gig. Xie Laoshi (a.k.a., “Jewel”) put together an extensive application packet that described TNCS’s vision for and current language instruction approach. To get a sense of how competitive the application process is, consider that TNCS is the only new elementary school to be awarded host status this year. Our Jewel’s application really must have sparkled! Startalk, a federally funded program through the National Foreign Language Center (housed at the University of Maryland, incidentally), was established in 2007 and was just renewed through 2020 to “teach strategically important world languages that are not now widely taught in the [United States].” These currently include Arabic, Chinese, Dari, Hindi, Persian, Portuguese, Russian, Swahili, Turkish, and Urdu and will also soon bring in the “language” of computer programming (to be developed right here in neighboring Towson!). One point of note is that Startalk encourages a move away from the perhaps ethnocentric term “foreign language” in favor of the more accurate “modern world language” or just “world language” to emphasize how we, as global citizens, really communicate now. At the Spring conference, our three TNCS representatives “divided and conquered” to be able to attend as many of the break-out sessions as possible. They nevertheless arrived at the consensus that there was no need to “reinvent the wheel” with TNCS’s camp theme but that they should adapt it to a proven successful format, supported by Startalk’s 7 years of existing data on how we actually learn language. Thus Jewel’s beautiful (and fund-winning) idea for summer camp, “Let the World Be Filled with Love” went through some late-night tweaking at the conference. To reiterate, the camp—even at the novice level—is conducted completely, entirely in Chinese. No English is uttered. How is that possible with kids who are being exposed to Mandarin for the first time? “Through the use of lots of visuals,” says Ms. Munro. Pantomiming, pictorials, modeling—whatever it takes to communicate. The story of Kong Rong actually comes at the end of the camp, when students have built up some vocabulary and some comprehension and are ready to put it all together meaningfully. Perhaps just as important, teachers absolutely do not focus on or correct grammar. Although this is quite a departure from the way many of us learned a new language, in which declension and conjugation were hammered into our skulls day in and day out, grammar is seen as just not all that important anymore if the point is conveyed. Communication is the crux of Startalk education, and that makes perfect sense. It’s why we set out to learn another language in the first place, after all. They just want people to start talking. (Get it? Startalking?) Thus, just as we model for our young children how to handle, for example, tense, program teachers will model for rather then correct their students. When our little ones tell us, “I goed to the playground,” we respond with something like, “How nice! You went to the playground!” rather than sitting them down for a grammar lesson. As Startalk’s 7 years of gathering and analyzing data to improve language instruction have demonstrated, incorporating the “5 Cs” in each lesson is critical. The 5 Cs should ring a bell because that’s Jewel’s approach to teaching at TNCS. So, Community, Culture, Connection, Comparison, and Communication intersect in the Startalk curriculum to foster and enhance language learning as well as make it relevant and meaningful to the student. Make it authentic. Communication is itself broken down into three types: interpretive, interpersonal (i.e., kids talking to each other in the target language), and presentational. This also ensures that the experience is real for the kids. Jewel already uses this approach, too. She gives students a problem to solve to get them talking and exploring in the language, such as where is so-and-so student today? Why isn’t he/she in class today? Simple, real-world experience gives the kids a context and a reason to talk. Language learning is paramount at TNCS, and, thanks to Jewel’s incredible intuition, insight, and innate instructional skill, the school’s language program is right in step with the most reliable language-learning metrics available. TNCS looks forward to sharing our passion for Mandarin Chinese and Chinese culture with your child during Startalk Summer Camp! For more information, please contact startalk.newcentury@gmail.com. For anyone interested in seeing any of the Startalk conference presentations, please click here. 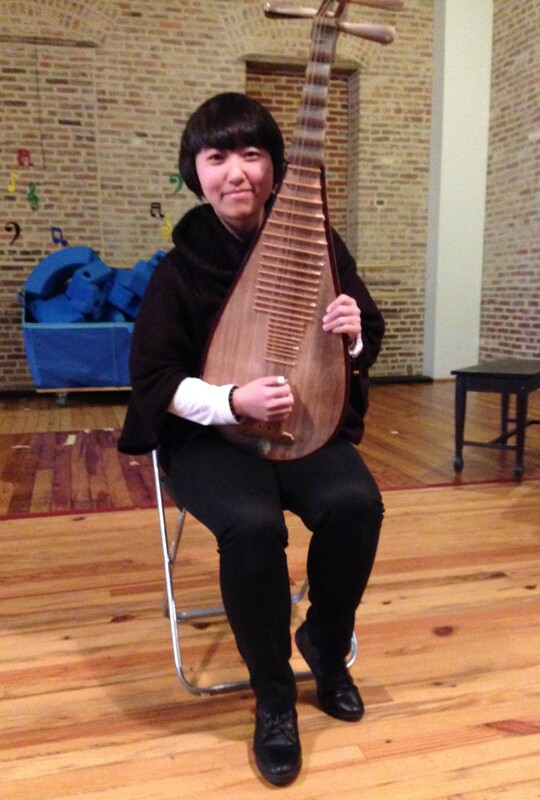 Li Laoshi poses with her pipa just before the concert began. On Thursday, October 24th in Building North, TNCS students got to see and hear for themselves just how talented Li Laoshi really is. As part of TNCS’s ongoing focus on studying other cultures as well as The Arts, Li Laoshi presented a 30-minute concert showcasing her pipa music. Staff and students alike, TNCS really enjoyed the pipa show! Li Laoshi played four songs, each very different, including her introductory song (“The Language of Pipa”; 琵琶语), the theme song from a cartoon (“Counting Ducks”; 数鸭子), a war song (“Surrounded on All Sides”; 十面埋伏), and the most popular pipa song in China (“Nezha”; 墨明棋妙 – 哪吒). As she began “Counting Ducks,” she invited the audience to sing along. Lo and behold, the entire student body sang right along—from the pre-primary students to the elementary students! During the last song, which was quite spirited, one of the elementary girls was spotted playing “air pipa”! Suffice to say, the kids loved the concert! For those of you who could not attend the concert, do not despair! Here is a video of Li Laoshi playing the third song in her line-up. Enjoy!